Of all methods of “alternative” dispute resolution, arbitration is by far the most traditional and, arguably the most expensive. Many arbitrations are almost identical to court proceedings except for the fact that Joe Public can’t walk in and listen and the parties must pay for their Judge. Like court proceedings however, arbitration is known for taking a long time and costing a lot of money. Notwithstanding the above, arbitration clauses are standard in many consumer contracts. These clauses essentially provide that in the event that there is any dispute between the parties under the contract, that dispute should be referred to arbitration. The agreement to go to arbitration forms part of the contract between the parties. Should a party attempt to bring court proceedings under a contract containing such a clause, these cases are generally met with the other party bringing an application to the Court to “stay” or halt the court proceedings in favour of arbitration. A recent High Court decision brought to light the difficulties that can arise in cases where not all parties to the court proceedings are party to the arbitration agreement. What happens in those circumstances? Surely it makes sense for the entire dispute to be resolved in one forum or another. However, the High Court recently ruled in such a case that only the dispute as between the parties who had signed up to an arbitration clause be referred to arbitration, the balance of the proceedings could proceed before the Courts. In this case, the plaintiffs had bought a car from a car dealer and had signed up to standard terms and conditions in the context of that transaction. They subsequently had difficulties with the car and sought to sue both the car dealer and the manufacturer in the Circuit Court. Only one of the plaintiffs, a married couple, had signed the terms and conditions, and therefore the other plaintiff was not party to the arbitration agreement. Furthermore, the car manufacturer was not party to any contract with the plaintiffs and therefore was also not bound by the arbitration clause. An application to stay the proceedings in their entirety was granted in the Circuit Court. 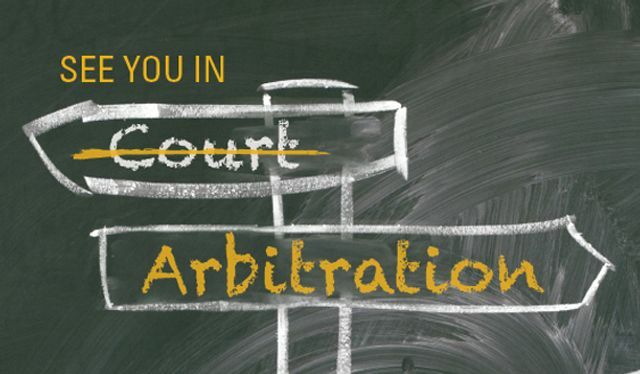 Under Section 11 of the Arbitration Act 2010, there is no appeal to an Order granting a stay in favour of arbitration in an action which is “the subject matter of an arbitration agreement”. In allowing the appeal, the High Court relied upon the fact that there was no arbitration agreement here as between the car manufacturers and the Plaintiffs, or as between the Plaintiff who had not signed the contract and the car dealer. The Court therefore ordered that those aspects of the proceedings which were not the subject matter of an arbitration agreement, be allowed to proceed. This decision takes little cognisance of the practical realities of dispute resolution in that it would be near impossible for the issues as between the Plaintiffs and the car manufacturer to proceed when the claim as against the car dealer has yet to be determined if there is any sort of dispute as between the defendants as to where, if any, the fault lies. The case dilutes the reliability and certainty which having a dispute resolution clause in a contract is intended to bring. If parties have validly agreed that a legal dispute should go to arbitration, then to arbitration that dispute must go. But if parties have not agreed that a legal dispute should go to arbitration, then to the courts that dispute should go.